Tourmaline (f.k.a. 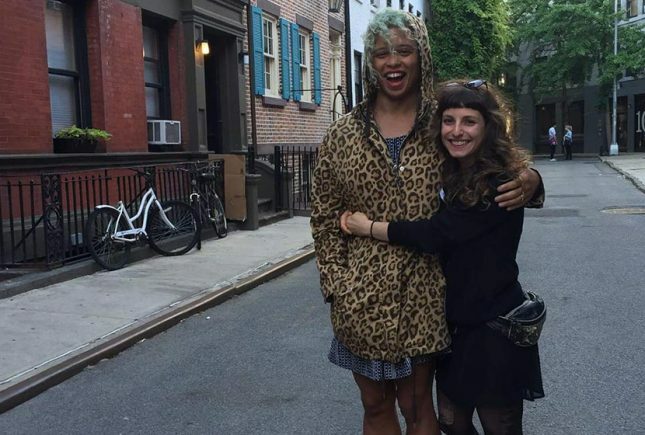 Reina Gossett) and Sasha Wortzel are currently directing Happy Birthday, Marsha! – a narrative short film about best friends and pioneering transgender rights activists, Marsha “Pay It No Mind” Johnson and Sylvia Rivera, in the hours before the 1969 Stonewall Riots. Tourmaline (f.k.a. Reina Gossett) is an activist, writer, and artist and the 2014-2016 Activist-In-Residence at Barnard College’s Center for Research on Women. As the membership director at the Sylvia Rivera Law Project from 2010 to 2014, Tourmaline worked to lift the voice and power of trans and gender non-conforming people. Prior to joining the Sylvia Rivera Law Project Tourmaline worked at Queers for Economic Justice where she directed the Welfare Organizing Projected and produced A Fabulous Attitude, which documents low-income LGBT New Yorkers surviving inequality and thriving despite enormous obstacles. Sasha Wortzel is a filmmaker, media artist, and educator working in video, installation, sound, and performance. Her work explores marginalized collective and personal histories in relation to space, gender, and desire. Her debut feature documentary, WE CAME TO SWEAT premiered at Newfest at the Lincoln Center in July 2014. She has presented work at the Berlin International Film Festival, Outfest LA, Newfest, Tribeca Interactive, Leslie Lohman Museum, A.I.R. Gallery, and the Guggenheim Lab. Her work has been supported by the Robert Rauschenberg Foundation, and she was a 2012-2013 fellow of filmmaker Ira Sach’s Queer/Art/Mentorship. She received her MFA from Hunter College. With Reina Gossett, she is currently directing Happy Birthday, Marsha! – a narrative short film about best friends and pioneering transgender rights activists, Marsha “Pay It No Mind” Johnson and Sylvia Rivera, in the hours before the 1969 Stonewall Riots.